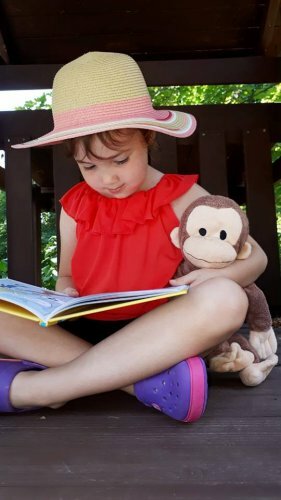 Foster a love for reading and learning all summer long with reading adventures of Curious George. 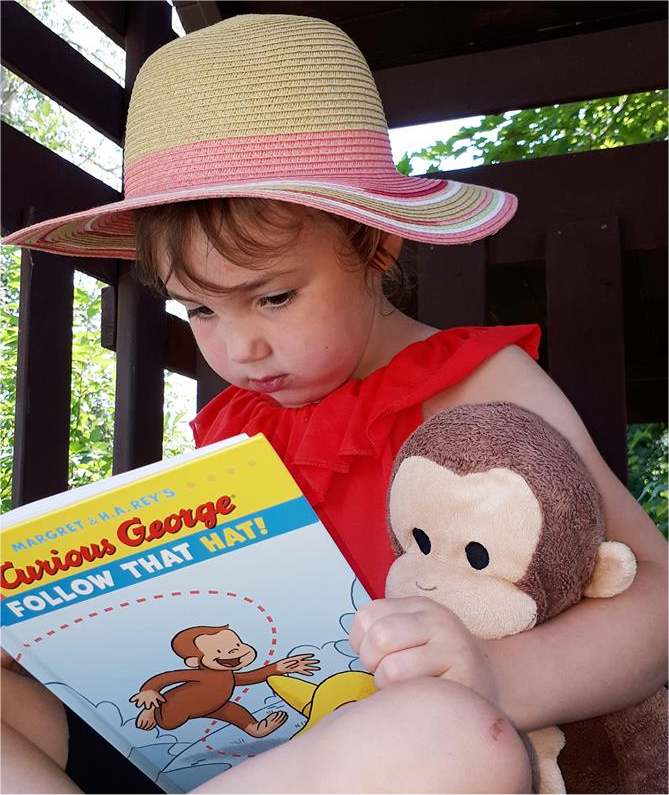 Even if your little one hasn’t started preschool yet, you can encourage a love of reading with Curious George. 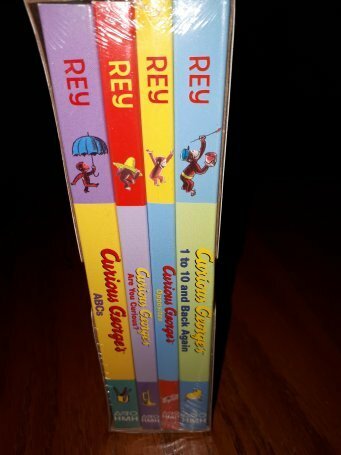 This set of four classic Curious George board books comes in a cardboard box. It is the perfect set for preschool age children two and up. 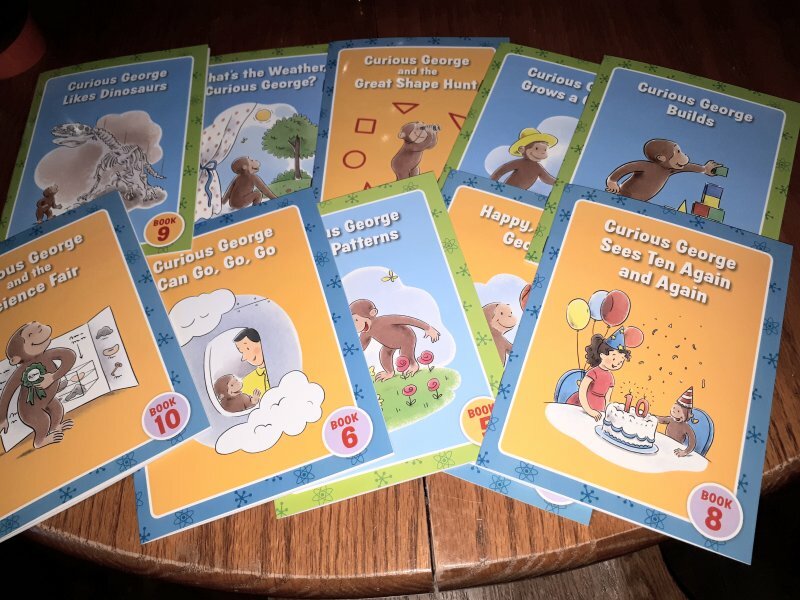 My friend’s son is a huge fan of Curious George and these books were perfect for him. He just turned three! He learns about basic concepts—including the alphabet, opposites, emotions, and counting (forward and backward)—with the help of Curious George. The books included in the set are: Opposites; Are You Curious? ; 1 to 10 and Back Again; and ABC’s. Curious George’s 1 to 10 and Back Again– Help Curious George count ten of his favorite things, first forward and then backward. 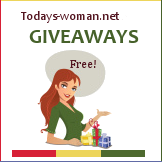 Curious George’s Opposite– George is up to his usual mischief in the simple book of opposites. 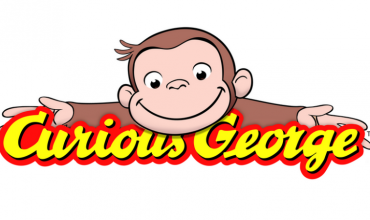 Curious George’s Are You Curious?– Curious children can read along with mom & dad to see if they behave like the monkey best known for getting in and out of mischief. Curious George’s ABCs– Read from A to Z along with George in a revised version of the classic Curious George Learns the Alphabet. 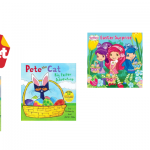 All four books are great for learning and are sturdy enough to hold up to repetitive use. 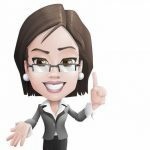 The stories them self are simple, fun and engaging. 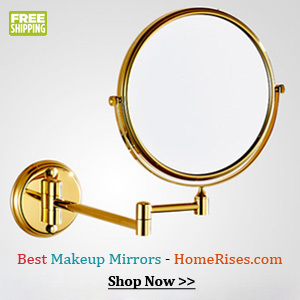 My friend commented that they are perfect for long road trips in the car this Summer! 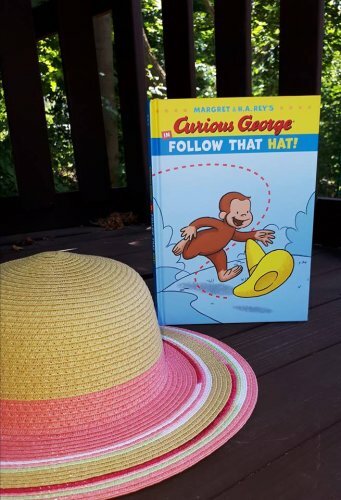 If your child is beginning to read independently, keep the learning going with Curious George in Super George and Curious George in Follow that Hat. Both of the following books are written in comic form. The Illustrations in the book are brightly colorful and engaging. Both books are more geared towards children already beginning to read. My daughter is still on first reader books, therefore she struggled with some of the words in the book, but was able to read both books along with me and was even able to read some of the words independently on her own. Released June 26, 2018, join Curious George on a super fun caper across the city. What happens when George and his friend Tim are faced with a real crime to solve? It’s Super George to the rescue! Also released “June 26, 2018,” join Curious George and his friend on a hilariously fun adventure as they head out to chase the man’s mysterious yellow hat. This boxed set of 10 original Curious George stories introduces young learners aged 4-7 to STEM (science, technology, engineering, and math). It also includes activity cards and a teaching guide for parents. 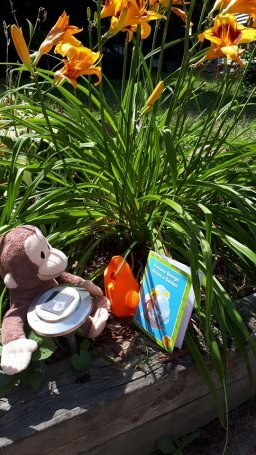 Curious George Math and Science Readers use engaging and funny stories to help children observe, question, predict, and explore the world around. The box set comes with 10 STEM books of different themes such as What’s the Weather Curious George, Curious George Grows a Garden, Curious George Sees Patterns, Curious George Sees Ten again and Again and more! With the STEM books is a set of activity cards for parents that suggest activities for parents to do as a family to further learning. One activity suggests taking a field trip to a museum to learn about something that is of interest to your child. STEM theme words used in the book are listed at the end of each book. On the opening page of the book along with the STEM words are a list of sight words. The sight words are a useful tool in helping first readers like my daughter sour into reading. 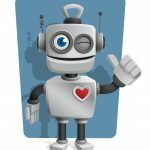 The STEM books also ask questions which engage your child in learning. 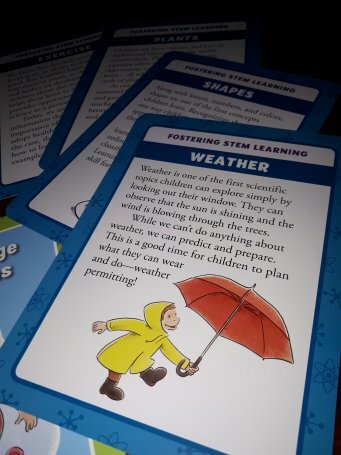 In the book What’s the weather Curious George the question ” What is the weather today is asked?” Questions like ” What will George do when it’s raining?” gives your child a chance to answer the question before you turn the page. Simple sentences are found throughout the ten small books along with lots of repetition. 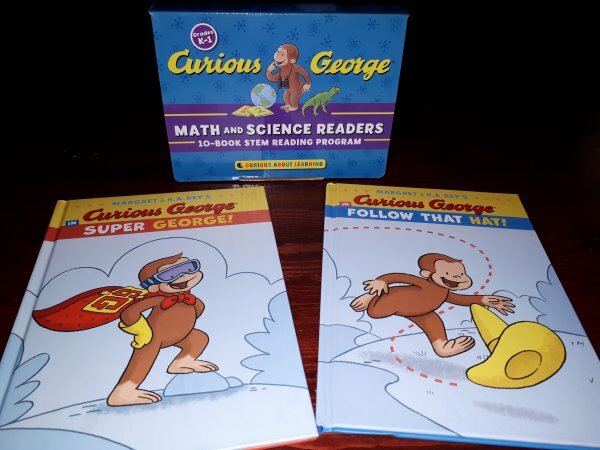 Overall, Curious George Math and Science Readers is a set of engaging, interactive STEM books that incorporated the reinforcement of science, math and engineering into learning. 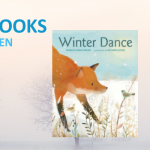 They are also a great set of books that capture the attention of young readers and make the perfect first readers for grades junior kindergarten to grade one. 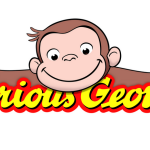 Help your child sour into reading this summer and back to school season with the above reading adventures of Curious George. For more Curious George book titles for kids pay a visit to hmhco.com. 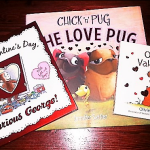 My must remember to get these books my little grandson is afterall a huge fan of the TV shows so I believe he may also love the books! 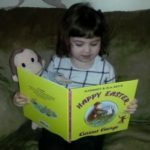 I just recently was introduced to curious George…lol…My great- niece read to me!